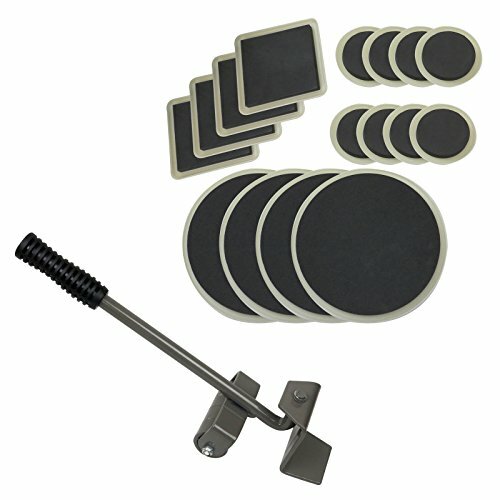 This furniture lifter and moving pads allow you to move furniture/appliance into place across any surface. Allows you to lift furniture using up to 10 times your natural strength. Helps you move up to 400 lbs. of furniture/appliances. The furniture lifter raises furniture/appliances up to 2 1/2 inches. Helps easily redesign and rearrange living space. Set comes with 1 Furniture Lifter and 16 Mover Pad Sliders in different sizes and shapes. The Furniture Lifter is made out of metal and is both light weight and durable. Measures 13.75 inches length X 4 inches width X 4.5 inches height including handle. The furniture lifter raises furniture/appliances up to 2 1/2 inches using the power of fulcrum. Furniture lifter measures 13.75 inches length X 4 inches width X 4.5 inches height including handle. Furniture Slider Measurements: Small Circles: 3 1/2" diameter, Squares: 4.25" by 4.25", Large Circles: 7" diameter.